Virtualization has become mainstream. More than 90 percent of midsize and large businesses have implemented virtualization at some level, according to research conducted by CDW in 2010. However, while many organizations have implemented virtualization,there is still tremendous room for growth. In the CDW survey, respondents said roughly a third of their total server infrastructure consisted of virtualized servers. Virtualization has become ubiquitous because it is solving some of the most challenging problems faced by IT and business leaders during the past decade: overprovisioning of IT resources, server sprawl, poor optimization, bloated space, high energy consump-tion and increased complexity in managing the IT infrastructure. 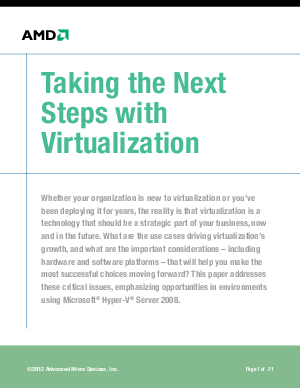 Download this whitepaper to learn more about taking the next steps with virtualization.